It’s Market Stats Monday here at Team AGC – and we are not negotiating! We had a beautiful snow day in Virginia today – crisp blue skies and fluffy white snow. 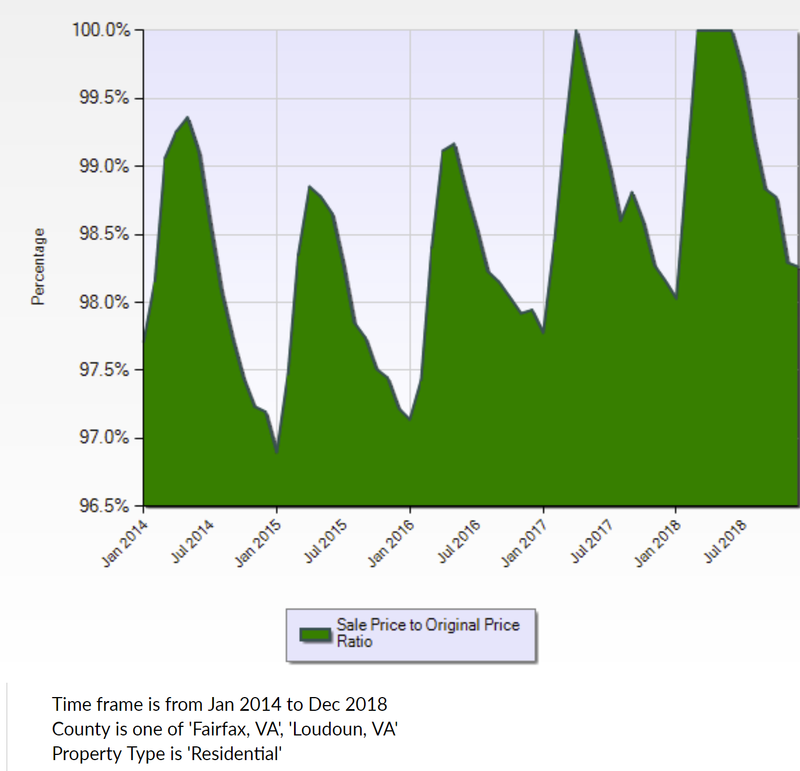 This week we are taking a historical view of property negotiations, also known as list to sales price ratios, in Loudoun and Fairfax County. This ratio is the amount a property is reduced by at settlement based on their asking price. There are several factors that come in to play here – was the house over/under priced, current inventory (supply/demand), interest rates, and consumer confidence. You may remember 2005 when homes sold for WAY over asking price, or 2009 when we hit the bottom of the market and discounts could be had easily – but what can a buyer or seller reasonably expect in 2019? Well, ratios have been getting tighter and tighter each year – cyclic with the seasons (more negotiation power in the winter) – however very little wiggle room overall since 2014. In 2014 the range was approximately 97-99% – meaning a home priced at $500k would likely sell for between $485k and $495k. In comparison, 2018 saw a range of 98%-100% – meaning that same $500k house would sell for between $490k and $500k. What does this mean for the average buyer or seller? Buyers should be prepared to make more full or close to full priced offers rather than negotiate with a low ball contract. It would be best not to look above your comfort zone, as there is very little flexibility in pricing and we would hate to have you fall in love with a home you couldn’t afford. Sellers would do best pricing their property competitively, at the market, and be prepared for it to sell at that price. If a seller were to push the market too much – the house tends to be rejected and ultimately will sell for less as many buyers wonder, “what’s wrong with it?”. These are averages and generalizations of course, as always – please reach out to us with any specific questions – we’re here to help!